Bermuda was hammered by two tropical cyclones in less than a week, Fay and Gonzalo. But hitting Bermuda was one of the few things the storms had in common. Despite having, perhaps, the highest concentration of hurricane modellers in the world, Bermuda was caught totally off guard by Tropical Storm Fay. 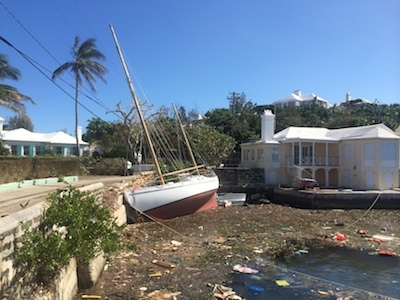 Less than a week after Fay caused considerable damage, Hurricane Gonzalo was well forecast but caused much less destruction than feared. NASA’s Dr Tim Hall explains what happened. Fay was a “messy” storm: gusty, broad, asymmetric, and not well forecast. Although official NHC sustained winds were 75mph in Bermuda (just below hurricane status)—it later briefly reached Category 1 (the least severe hurricane), and gusts were measured of at least 120mph. Fay was also a rapid intensifier. A weak subtropical depression on October 10, which was initially forecast to fizzle, Fay was nearly a hurricane by the time it hit Bermuda late October 11. Two differences between Fay and Gonzalo stand out. Firstly, for Fay, the duration from formation to Bermuda impact was less than two days, while Gonzalo’s duration was about 7 days. Secondly, Fay was a broad, gusty, asymmetric storm, whose rapid intensification was poorly forecast, while Gonzalo was a tight, symmetric tropical storm whose intensification to major hurricane was well forecast. That the officially “weaker” Fay did comparable damage to Bermuda may well be a testament to the power of the unexpected. Dr Hall is a climate scientist at the NASA Goddard Institute for Space Studies in New York City. He specialises in hurricanes and their relationship to climate. He develops statistical hurricane and weather hazard models, and has worked as a consultant to RMS and reinsurance companies. Click here to be redirected to the Insurance Linked website for more updates and releases.